Negotiation skills are critical for any leader as it contributes towards the success of various organizations globally. We cannot undermine the value of negotiation skills which is at the center of any business strategic initiatives. Being a good negotiator usually implies more sales motivation, leading to the best deals for the advancement of the organization. Apart from making interesting deals, it also leads to an improved supplier relationship management, contributing towards creating a sustainable competitive advantage and managing conflicts. Various studies and publications have highlighted that companies might be missing out on some remarkable deals if they have poor negotiation techniques. A good way to enhance this crucial skill is through training and development. Traditional learning has proven to be effective in the past decades; additionally new emerging methods of learning and development combined with technology have proved to be very effective. The increased popularity of e-learning as an innovative learning method to achieve significant improvements is highlighted by the research of Docebo E-learning market trends & forecast 2014 – 2016 report which indicates that the huge growth of the e-learning industry has been up to 900% since the year 2000. This is mainly due to the additional features that corporate digital learning can offer which allow learners to be more engaged. For example: digital learning involves e-courses, simulations, gamifications and webinars. Nowadays more and more companies are opting for e-learning solutions to train the employees. According to the IBM report about ‘The value of training’, every dollar invested in online training results in $30 in productivity and other studies have shown that organizations can achieve 18% boost in employee engagement by using e-learning technology. This post outlines a few ways how e-learning contributes towards increased negotiation skills of employees. Negotiation doesn’t only mean discussing but also learning to listen attentively and analyze what the other person is saying. This often leads to thoughtful conclusions. Strong listening skills can help sales people to recommend what the client is looking for and at the same time keeping in mind how to make the best deal. One of the main advantages of e-courses is that they can be design in the form of real life work situations where the learner feels actively involved. The e-learning programs at Procurement and Supply Chain Academy are designed in this engaging way to allow learners to get the most out of their training programs. Studies revealed that 40% of people respond to visual information better than plain text and are 60,000 times faster to process visual data than text. Now how do these e-learning solutions help to enhance active listening skills? These scenario-based e-courses allow learners to become acquainted with virtual customers and identify their needs and concerns. In this way, they are more engaged in the training which later helps them to apply their knowledge at their workplace, using the skills they acquired during the course. The importance of communication skill is listed in the top four job skills which predict both employer and employee satisfaction. It is a key skill which cannot be overlooked to maintain good relationships as well as to ensure the successful continuity of any business. To further enhance this capability, role-dependent levels of training can be given to employees to make sure that they are communicating effectively in favor of the company. For example: Negotiation scenario-based e-learning courses and simulations can be provided to procurement professionals to ensure that they make the best deals with suppliers and at the same time tactfully maintain a good relationship with them. In addition, the e-courses which are based on real work situations allow learners to communicate efficiently according to their roles. This results in a successful team that works with higher professionalism and responsibility, leading to high productivity. Above all, customer satisfaction is a key element to be considered when it comes to negotiation. Employers usually need a workforce that has the ability to digest information, find patterns, interpret them and reach a strong conclusion. Gamification allows learners to engage in playing games specifically designed to enrich their professional skills. Through gamifications, learners already get a taste of how to identify the need of each virtual customer, gauge their interests and figure out how to address their problems and concerns. With such a high engagement rate, learners are able to further develop their analytical thinking skills by moving forward through the games. As a result, they can apply these skills in their job more efficiently and become good negotiators in relation to customer service. Studies have shown that gamification enhances learner engagement and improves retention. 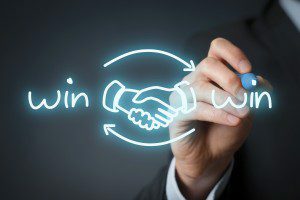 The goal of negotiation is not only limited to create a win-win situation for parties, making the best deal or simply maintaining a relationship of equal standing. It also serves as a means to achieve the company’s objectives. With the innovative features of e-learning programs, professionals are equipped with superior negotiation capabilities and consequently, they can directly apply their skills and knowledge in their day-to-day jobs.